The NVIDIA GeForce FX Go 5600 / 5650 for notebooks was established as a competitor to ATI Mobility Radeon 9600. However, the ATI card was clearly faster. It offers multi-screen-support (external screen additionally) and DirectX 9 functions. 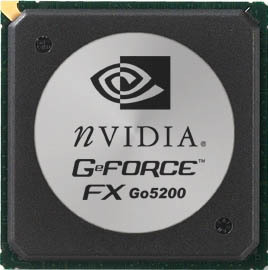 The successor was the enhanced GeForce FX Go 5700. The 5600 has either 4x1 or 2x2 design (pixel- x vertex-shader), which depends on simple or double textured pixels. The NVIDIA GeForce FX Go 5200 for laptops has been positioned as a competitor to ATI Mobility Radeon 9200. It offers multi-screen-support (additional external screen) and DirectX 9 functions. Currently, it is a competitor of the faster integrated graphic chips like the ATI Radeon Xpress 1150. The GeForce FX Go 5300 was an OEM version for Medion with lower clock (275/250 MHz) and 64 MB RAM.